“The endless wide of nature…” That’s my first answer if someone asks me, what I love about Africa. If you never drove through the vast and lonely emptiness of Namibia or never stood on a mountain in the Serengeti or Maasai Mara, then you probably don’t have any idea of what I’m talking about – and you’re very right in this Blog. Here I want to infect you with my enthusiasm to this continent – especially to Kenya. 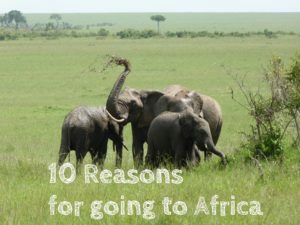 So if you are wondering if your next holiday should lead you to Africa, take these reasons into consideration. If you want to get more reasons why to visit this beautiful continent, I would be happy if you keep updated with this Blog. This entry was posted in Tips & Tricks and tagged Adventure, Africa, Big Five, Bucket list, Elephant, Holidays, Kenya, Maasai, Maasai Mara, Massai, Nairobi, Reasons, Safari, Travel. Bookmark the permalink.